I’ve been hearing rumors about a geothermally heated townhouse in lower Manhattan for awhile now, and have been meaning to go check it out for almost a year. Now it appears the moment has finally arrived – the geothermal house has just gone on sale. Asking price? A whopping 7.8 million. But just think of all the money you’d save in utilities! You wouldn’t necessarily think that the geologically inactive New York City would be a great place for geothermal energy schemes. Afterall, this isn’t Iceland or Northern California. However, apparently, if you dig deep enough into the surface of the earth, you can tap geothermal energy anywhere. At 1100 feet underground, the geothermal pump for 156 Reade Street is nearly as deep as the Empire State building is tall. 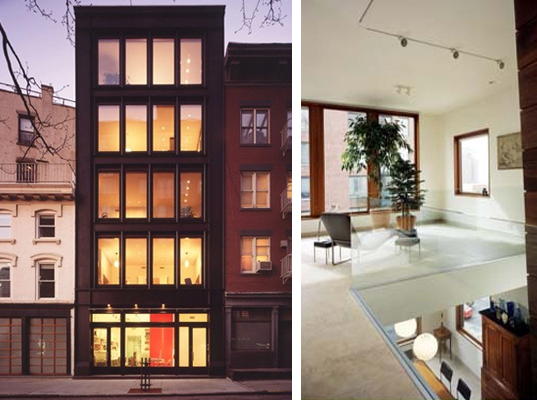 You can read more about the 156 Reade Street building in The Green House, available from Princeton Architectural Press. Does anyone know which company installed the geothermal system at the townhouse in Tribeca? Do you know of any Brooklyn brownstones that have installed geothermal heating?